Gathering resources can be an exhausting business. Hours can be spent collecting feathers for arrows or in search of enough Ender pearls to find a stronghold. Luckily with enough planning and effort, the hard work can be done for you with mob traps! Mob traps are mechanisms that trap, kill and collect loot from monster or animals mobs. They are usually powered by either redstone, lava or water, and some use gravity alone. Mob traps range from extremely simple to very complex. During last Saturdays Weekly Workshop, we built three of the most commonly used types of mob traps, each utilizing different game mechanics to their advantage. We will be going over each trap made and its unique advantages. Animal traps are different than monster traps for several reasons. For instance, monsters appear in darkness or in bulk at monster spawners, so you need to either create darkness or wait for night in order to trap and kill them. Animals on the other hand spawn on undisturbed grass in daylight conditions. Animals can be killed in several ways. 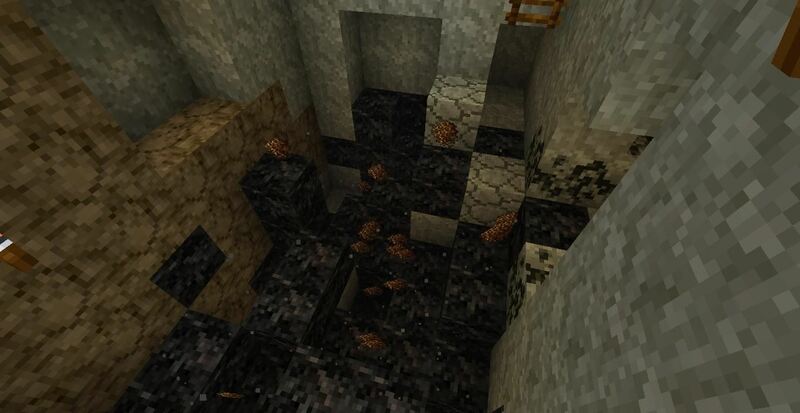 For traps, the most common methods include making them fall to their death, drowning them, or burning them in lava. In order to optimize the effectiveness of your animal traps, we'll need to know more about them. Animals are attracted to light and grass. If there is a lot of grass nearby, they will walk toward it. If they are completely surrounded by grass, they will wander aimlessly. If they can't see any grass, they will wander toward light. This is important, because you can attract animals to your traps at night, or keep them spawning all day if your trap is enclosed and well lit. With the exception of the chicken, animals will die from a fall of 23 blocks. Another very important difference with animals is that you can breed them using wheat. This means that you have more control over the amount of animals you have in your traps. Let's go into a little detail about each animal type. Chickens: Chickens drop feathers, meat and occasionally eggs. As you may know, these eggs can be thrown and broken to create more chickens, but there is only about a 30 percent chance of success at any given time. Breeding animals with wheat is much more efficient. Cows: Cows drop more meat than any other mob, as well as leather for armor. When approached with a bucket, they will give you milk that's needed for crafting the almighty cake. Pigs: Pigs drop one to two pork chops, which will come out cooked if they die from fire or lava. Sheep: Sheep are needed for creating beds. They will drop more wool when sheered than when killed. 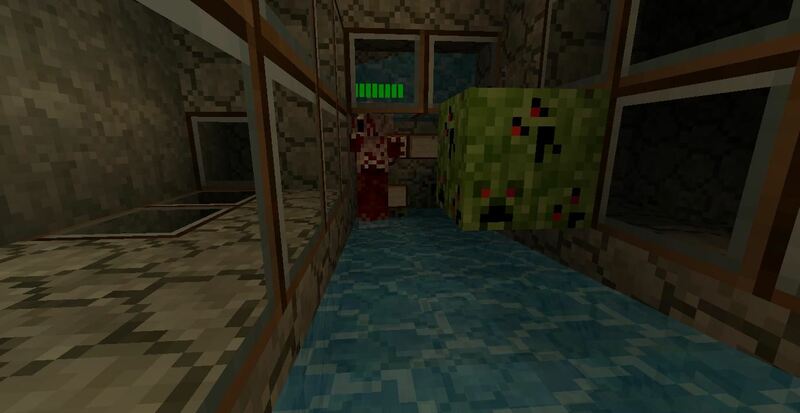 With the exception of Nether Mobs, monsters appear only at night or in dark areas. 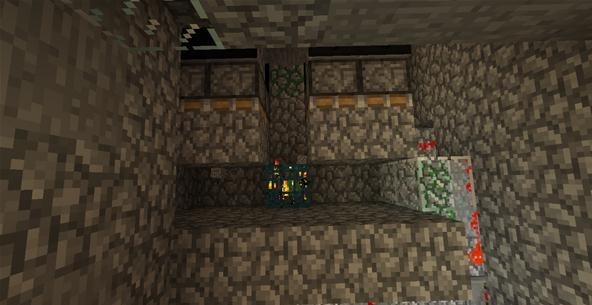 They can also appear in dungeons which have a mob spawner block inside them. Monsters can be killed by the same means as animals. Monsters will always spawn 24 blocks away from where you are during their spawn cycle, so some monster traps fail to work if you are within that amount. While monster mobs die in the same way that animal mobs do, there are some exceptions. Most monsters will die when they fall 23 blocks, but this has changed for some mobs, so your best bet for killing them via falling damage is about 26 blocks. Cave Spiders: Cave spiders appear only underground and are most common near their spawners, which can be found in Abandoned Mines. They drop string and spider eyes. 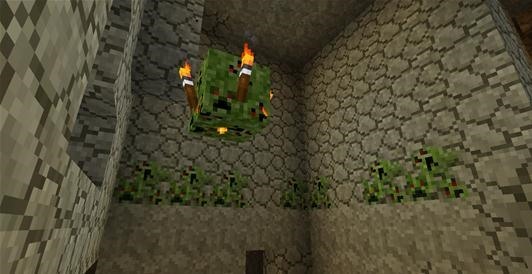 Creepers: This most notorious monster drops gunpowder, which is needed for TNT. Traps that collect drops from creepers are a much sought after alternative to killing creepers on your own. Skeletons: Skeletons drop bones and arrows. Since arrows are rather time consuming to make, skeletons drops are a great thing to come by. 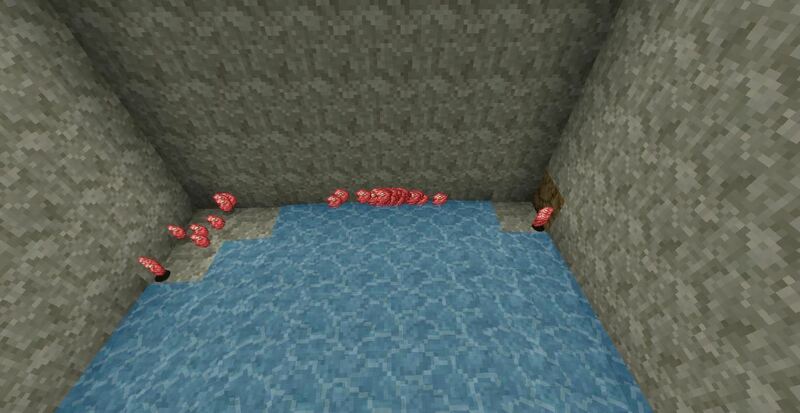 Slimes: Slimes have been much more elusive than other mobs, but will be much more common in the 1.9 update. Their only drop—the slime ball—is the key ingredient used in crafting sticky pistons. Spiders: Spiders are more common than Cave Spiders as they occur above ground, but they drop the same loot as Cave Spiders (string and spiders eyes). 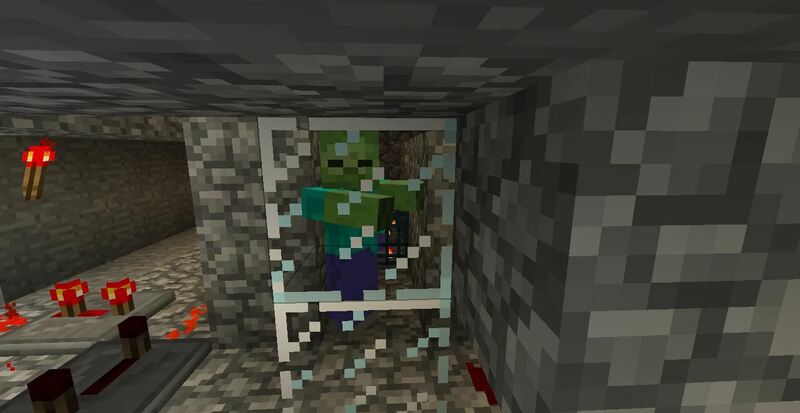 Zombies: Zombies are a less desired mob for traps as of 1.8, since they now only drop rotten meat. Rotten meat is sometimes an alternative food source, but will more than likely give the player food poisoning. By far the simplest method of killing mobs is gravity. Forcing mobs to fall to their death sometimes only requires digging, but more than likely will require more planning than that. Remember, this will not work for chickens (they can fly) and may only work sometimes for spiders (who can climb up walls). Animal traps that use gravity can be fairly simple. After all, the trick is to get animals to fall into a hole. Remember though, animals will only spawn on grass and will avoid falling to their death if they can help it. When running into trouble getting gravity traps to work, the solution is water.  Water is often used in mob traps to push animals or loot in any given direction. In this case, I simply placed a few long troughs of water running into a pit. Animals are drawn in and are forced down the pit. There are many variations of falling traps for animals, but they all rely on open grass, so the variety of traps possible are not as great as monster traps. And as of 1.9, one can simply breed animals, so animal traps are no longer completely necessary. Another benefit to using water is that loot will be pushed to one side. For my monster gravity trap, I used a zombie spawner as an example, only this time digging a pit wasn't enough. The zombies fell and were hurt, but were not dead. Here is a side view of the mob trap. 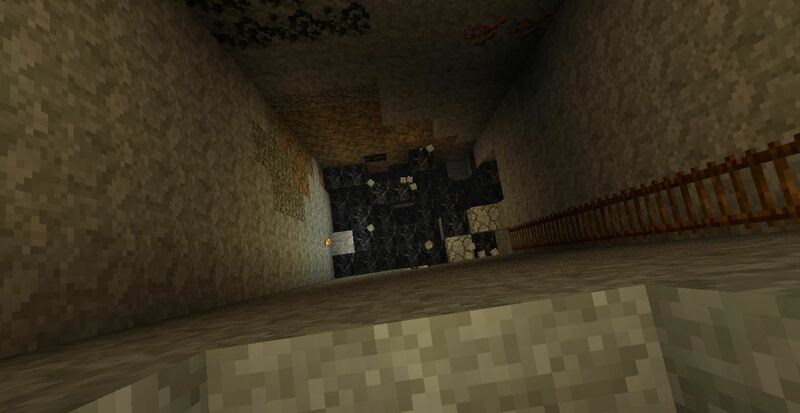 You may often run into this problem when making traps with mob spawners underground, as one can come to hit bedrock fairly easily. Here is the fall the mobs take. It's about 21 blocks deep, which is not deep enough to kill them outright. In this case, the solution is an elegant, simple design inspired by user mcKS. One can create an elevator of sorts with water and signs in order to increase the height mobs will fall from. 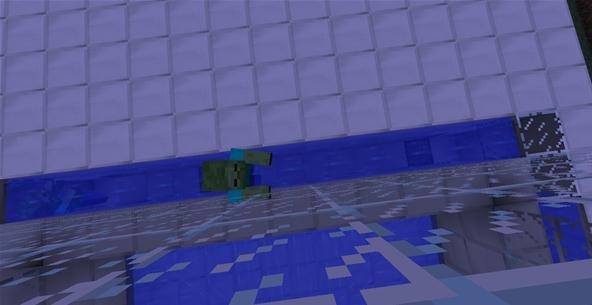 Monster and animal mobs will jump when in water and it's this jumping motion which forces them up the elevator pictured below. (1) Mob trap design by user mcKS. 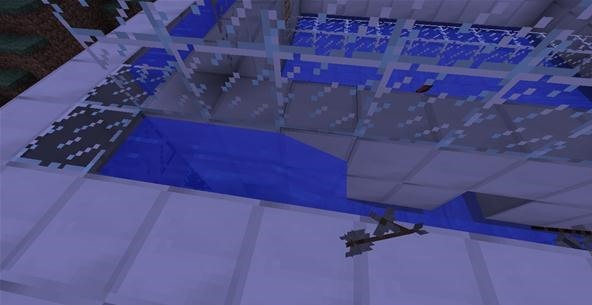 Mobs are forced up the water elevator and are dropped to their death on the left. (2) The zombie is being forced up the water elevator, due to his natural "jump in water" reflex. 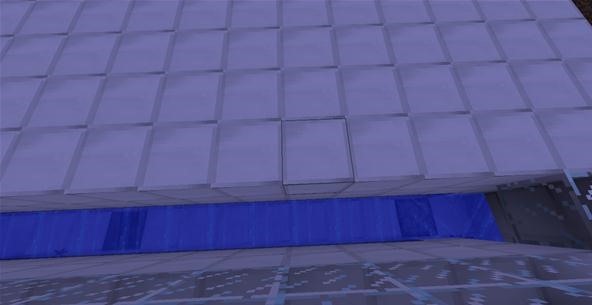 (3) Here is the other end of that elevator, which is about seven blocks higher than the mob spawner, meaning the mobs will fall 28 blocks to their death. You may need to adjust your display to see the image (it's pretty dark). (4) The result is a lot of zombe flesh! The gravity trap is a simple and effective, but not perfect for every situation. 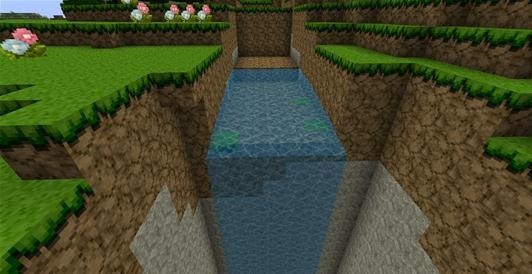 Water is one of the oldest Minecraft mechanics and it's effective for all types of applications. As we have seen, it can turn a failed trap into a functioning one. 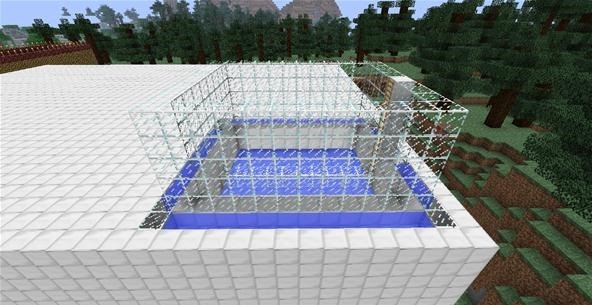 Let's look at another kind of trap that uses water, not to drop mobs to their death, but to drown them. 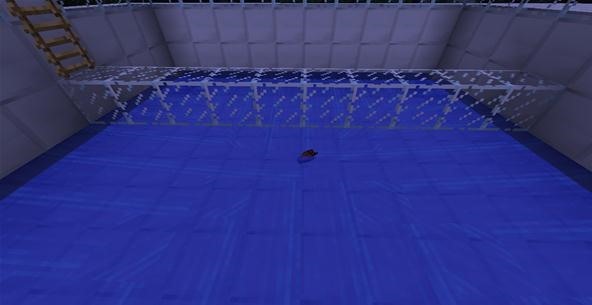 By far one of the oldest and most effective Monster traps relies on using water to drown mobs. This method sometimes requires less time than gravity traps and yields much more loot over time. There are several variations and ways in which to drown mobs, but let's look at an effective small scale trap. The particular water trap we built for Saturday's Workshop was fairly easy to construct. It works by trapping prey who just happen to walk into any of its four sides at anytime. The unlucky mob is pulled underwater, drowned, and the dropped loot moves into the center of the trap ready for you to collect. The size of the trap can be a box 10 by 5 squares or larger. The trap is surrounded by trenches on each side that are 3 blocks deep. The far wall of each trench is filled with water so that 4 flows of water are constantly pushing towards the center of the trap. Each trench is then filled in with water from above. The resulting effect is water that pulls prey down and forces them against the walls of the trap, not letting them come up for air. When the trapped mob dies, the dropped loot moves into the center of the trap ready for you to collect. Here you can see a zombie getting sucked in. A redstone trap can range from simple to extremely complex. As one could imagine, there are various possibilities. For example, user ML32 created a redstone trap that yields about 60,000 items an hour. While obtaining tens of thousands of items an hour isn't necessary, it's certainly a testament to the power of redstone. 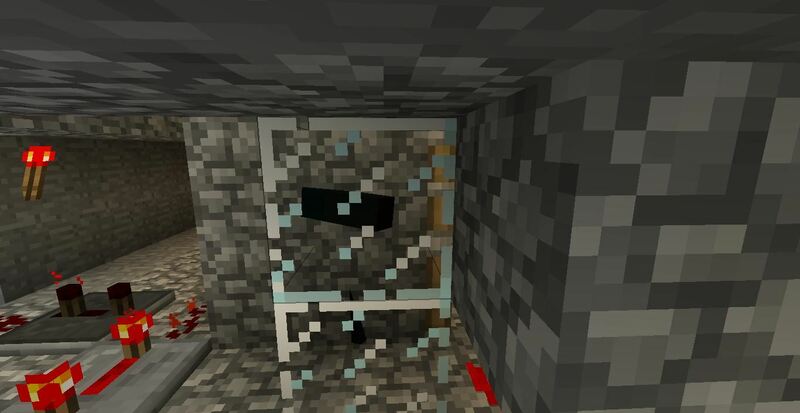 A redstone trap will typically make use of pistons, dispensers, pressure plates, and the like in order to either make the trap more efficient or to add a special feature like a warning system to alert the player that loot has been obtained. For our purposes let's look at a trap that uses redstone as its mechanism for the mass harvesting of mobs. Our redstone mob trap uses pistons to pummel mobs and collect their loot. It runs off a redstone clock that closes the pistons on our prey intermittently. Admittedly, this system isn't any faster or better than using water or gravity, but it is a fun use of redstone and it's sure faster than digging or calibrating a lava and water trap. Here, we made sure to close off all possible escape routes. There is nowhere for the mobs that spawn to go, so they are crushed to death. (1) If you're using a mob spawner, be sure to fill in any empty spaces within 8 blocks of it to avoid the mobs spawning outside of the death zone. (2) Here the zombies are being crushed to death over and over again. When trapping animals, use light to attract more of them during the night or if you've built an animal trap indoors. Cover your monster traps so that they spawn night and day. Be sure the area is large enough to encourage a spawn cycle if you are not using a mob spawner. 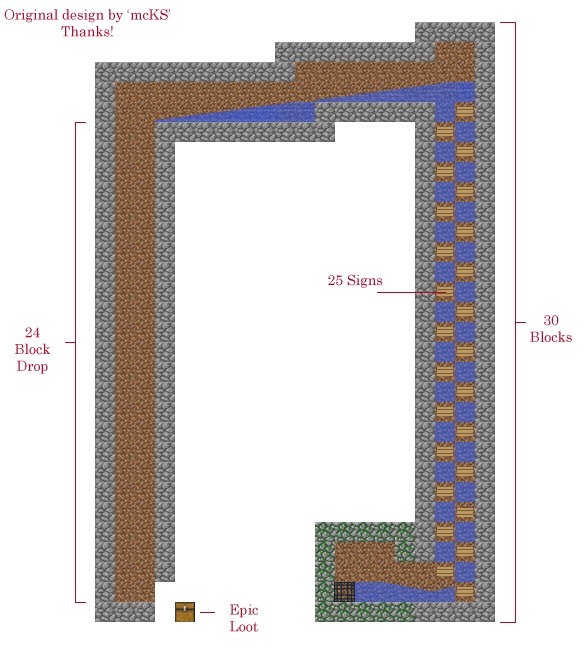 If you are relying on fall damage to kill mobs, be sure the fall is at least 23 blocks deep. When using lava in conjunction with water, be sure that your mobs only pass through or touch lava, as it will destroy anything they drop. When drowning mobs, be sure to use a second source of water besides a downward pour. Monster and animals need to be pinned against blocks, otherwise they will easily climb out of your water trap. Place plenty of chests near your traps for easy access. Check them often to avoid losing loot. Simpler is better. While super complex traps are impressive, they take a lot of tinkering to perfect. The less mechanics you use the less chance there is for something to go wrong, and often simple traps are just as effective as complex ones. The traps we went over are probably the most commonly used traps used in-game, but they certainly aren't the only ones. As with all things in Minecraft, there is a stunning variety of traps in differing forms, fashions, and functions. If you are interested in seeing any of the traps mentioned here, simply log onto to the server and type "/warp traps" in game. If you are not yet a member, you can apply to be whitelisted here. If you have any questions about our Weekly Workshops or about this guide, feel free to ask it in the comments section below or start a thread in the forums. i get so horny from seeing this!!! No problem, thanks for reading! Are you a member on our server? how do I construct and keep animals in a farm? What other effective traps are there? Where would be an ideal place to set a trap in regards to landscape (not in relation to the distance between house and trap)? What do the different parts of a redstone trap do? How do I attract animals to trap using grass, do I build a trap that surrounds a lot of grass for the animals to spawn on or what? would lining the walls of a gravity trap with water make it so that spiders can escape it? How do you cure food poisoning from eating the rotten meat? How would I make a lava trap? That's all. Again, thank you very much for the article. I really appreciate how many pictures you have implemented into your article. make it so that the mob pases through lava, dies, and then lands in water to save scraps. this isn't that exhaustive of a guide... ... jus' sayin' you could've added A LOT more to the article. Just to put it out there, 23 is actually the amount of blocks a mob needs to fall to be JUST ALIVE so that you can one-hit it, and is actually used for XP grinders. Not only that, but chickens, cows, sheep and pigs now only spawn upon generation of new chunks (going to new lands) so they won't continue to spawn on grassy area. Breeding is now the best way to make a sustainable mob farm. So what is the number of blocks all MOBs/ animals need to fall (except for chickens) to die?